Sweat sauna therapy has been proved to be effective to help the body detoxify while strengthening the immune system to fight against sickness from the common cold to life threatened disease like heart attack.Since sweat contains more toxins than urine, the skin is also called the third kidney. 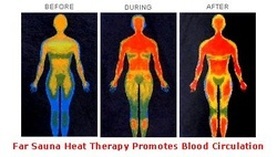 The heat from sauna therapy induces sweating and helps to eliminate heavy metals and toxic chemicals through the skin. Unlike sweating during exercise, the passive sweating during sauna does not involve the sympathetic nervous system, which disrupts toxin elimination. 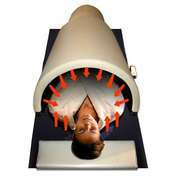 Far infrared(FIR) sauna uses infrared radiant energy to directly penetrate the body’s tissues. The energy output is tuned close to the body’s own radiant energy wavelength so that our bodies absorb more than 90% of the beneficial infrared waves. The air is cooler than the traditional sauna since infrared is absorbed by the body instead of simply heating the air.As a result, you will have more pleasant experience due to cooler air while getting the effect of penetraing infrared heat. Far infrared is considered to be the same energy called "Chi".They can be emitted from the hands of Chi Gung Masters to cure people's illness,which is called "palm healing".According to the traditional Chinese medicine, Chi is the root of health,spring of life,and source of happiness.So we will feel happier and less prone to illness when exposing to FIR frequently. Reduce heavy metals such as mercury, aluminum,cadmium, lead. Reduce cholesterol, sulfuric acid and other environmental toxins. Reduce chemicals, including arsenic, formaldehyde, pesticides, agent orange, industrial chemicals, and gasoline. Reduce alcohol, nicotine, heroine, and prescription drugs. All the sessions can combine with detox massage to achieve maximum benefits of detox. Feel free to call us to try the rejuvenating sauna therapy at 240-669-6453. Please to note that we require minimum 24 hours notice of change or cancellation.